The last week of February I received multiple calls about worms crawling on top of the snow. Most of the calls came from Yates and Seneca counties but I'm sure this strange event occurred in other areas across the region. Many were concerned that they were armyworms overwintering from the "2012 Armyworm Invasion". This goes to show how bad the armyworms were this past year and the damage they caused has not been forgotten. 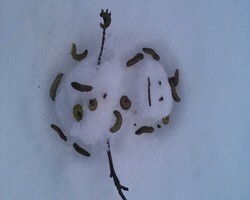 Many callers reported that seagulls were feeding on the caterpillars and were the first indication that something was out on the snow. Were these armyworms? No. Armyworms do not overwinter here in NY. It is too cold for this species to survive. New adult moths migrate from the south every year to lay eggs and repopulate the northeast. These caterpillars looked and acted very similar to armyworms so it was a good first guess! So what were they? These beasts were winter cutworms. Yes, there are species of cutworms that overwinter in the larval stage here in NY. We are more familiar with its close cousin the black cutworm. The black cutworm, like the armyworm, does not overwinter here in NY. The winter cutworms I have seen this year range in color from green to a dark brown. This cutworm has a series of black dashes running down the top of its back. While most of the reports have been of large worms over two inches, a few have been smaller. Why were they on top of the snow? The warmer temperatures had them feeding on plants under the snow. The ones I had in a container overnight had lots of frass (bug poop) in the bottom. We had some rains that compacted the snow and made it very heavy. In addition, the water sat on top of the ground because the ground was frozen and had nowhere to go. Between the saturated conditions and the heavy snow, the cutworms had to escape on top of the snow. Winter cutworms do not have the pest status that their cousins uphold. They are one of a very few cold-tolerant insects that can come out during the winter months. They do the majority of their feeding in the late fall but can stay active on warmer days throughout the winter feeding under the snow. I had other calls in January during our first thaw and reports of worms crawling across driveways and into farm buildings. This mass movement is also very reminiscent of armyworm behavior. There are definitely more winter cutworms overwintering this year than I've ever seen before. Will they cause damage to agricultural crops this spring? We normally do not consider this cutworm to be of any economic importance to crops. They do feed on a wide variety of hosts. A few years ago, I had one feeding on my spider plant I had brought inside for the fall. There is a possibility that with the high numbers we are seeing this winter that some small areas of winter wheat, pastures, or hay fields could have seen localized feeding damage late last fall and over the winter. There are very few reported cases of economic damage associated with this insect. It is very unlikely that we would have to spray an insecticide to control winter cutworm larvae this spring.